Apple did it again. The wise guys at the Cupertino based company were able to cramp 4GB of memory in a capsule that's smaller and thinner than a thumb drive. I'm talking about the new 4GB iPod Shuffle that I recently purchased online. It's so small that my initial reaction was that of fear, fear that I might lose it within a month or so. Thank goodness it has a clip that is sturdy enough to keep the iPod from falling off when I attach it like a lapel on my shirt. The latest iPod, a third generation Shuffle, is packed with features that were recently unavailable to the line that one would wonder where these are packed inside a space that is just a few centimeters thick (or thin). The new Shuffle, as mentioned earlier, has 4GB of disk space, twice the last space its last iteration had. That's the same size as my old but still working iPod Mini. It has a battery life of around 10 hours. And now, one can make multiple playlists and be prompted by a female speaker, known as the VoiceOver feature. At first, I thought the voice would come up everytime a new song is about to be played. A female voice would tell the title and artist of the song currently playing when I click and hold on the remote control attached to the earphones. Hold on to the remote until a tone is heard and the VoiceOver will tell the playlists available and just click to select it. Two clicks would transfer to the next song and three clicks would go back to the previous song. The volume control is also found on the remote control. There's also a switch on the body to turn the shuffle on and off. Use the same switch to tell the Shuffle how to play the songs, whether in sequence or in random order. There's a light indicator for the remaining battery power. To get a reading, turn off the shuffle and then on again. VoiceOver will tell the listener how much power is left (ex. Battery 75% full). Oh, when the shuffle is switched off, it will play for a few seconds, so there will be no disruption in listening while checking the battery. 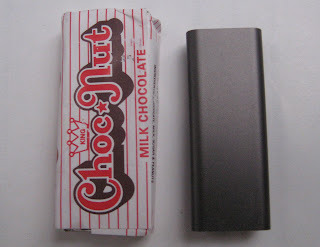 I took a picture of the shuffle and found it even smaller than a favorite Filipino sweet, the Chocnut. See for yourself in the photo below. A USB cable is included to charge the iPod through the computer. This is also the same cable used for syncing with iTunes. The user will be prompted to download the VoiceOver kit on the first connection. I have included around 5 playlists already, including the one I will use while I exercise. The iPod Shuffle is so light it did not affect my walking exercise when I tried it. In spite its size, I am confident that this small wonder would last a long time. I know because I can attest to the quality of an Apple product. Thanks to my iPod Mini and iBook.